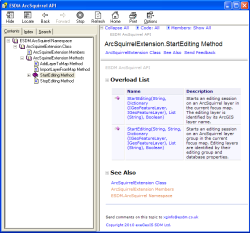 GISquirrel includes an API that allows application developers to integrate its functionality into custom ArcGIS or ArcGIS Engine applications. The API is simple to use in both VBA and .Net applications. When combined with the ability to read/write directly to the underlying SQL Server or PostGIS database, this gives the ArcGIS application developer unprecedented power to create user-friendly and robust multi-user applications. Add a tool to a custom toolbar to allow users to draw a polygon and popup a data entry form. The new data is saved into the SQL Server or PostGIS database. Give users a simple tool for splitting or re-shaping features, preventing editing conflicts with other users. Provide a tool for a data manager to validate or reject records that have been collected through a web interface. For full details of the API methods, please download the help file to a local folder, extract the CHM file from the Zip archive, and double-click to open. The GISquirrel API can be used for no extra cost, so long as each GISquirrel seat is licensed. However, if you want to re-sell applications incorporating GISquirrel, please contact us for a value-added reseller licence. Note for .Net developers: you need to target .Net 3.5. when developing for ArcGIS 10.3 or earlier, which do not fully support .Net 4. If you edit its app.config file ArcGIS 10 versions prior to 10.4 will run plugins targeting .Net 4, but internally they run 3.5. So it’s not a good idea to target .Net 4 as there will be some overhead marshalling between .Net frameworks. GISquirrel for ArcGIS 9.3 to 10.3 targets .Net 3.5 (ArcGIS 9.3 does not support .Net 4 at all). GISquirrel for ArcGIS 10.4 and later targets .Net 4.